Download "A Quick Start Guide to EMIR: What you need to do and when"
1 Legal Update January 2013 A Quick Start Guide to EMIR: What you need to do and when On 19 December 2012 the Commission adopted the majority of the subordinate legislation necessary to implement Regulation (EU) No 648/2012 of the European Parliament and of the Council of 4 July 2012 on OTC derivatives, central counterparties and trade repositories ( EMIR ). The majority of that legislation is likely to become law in or around March and some risk mitigation requirements will apply at that point. 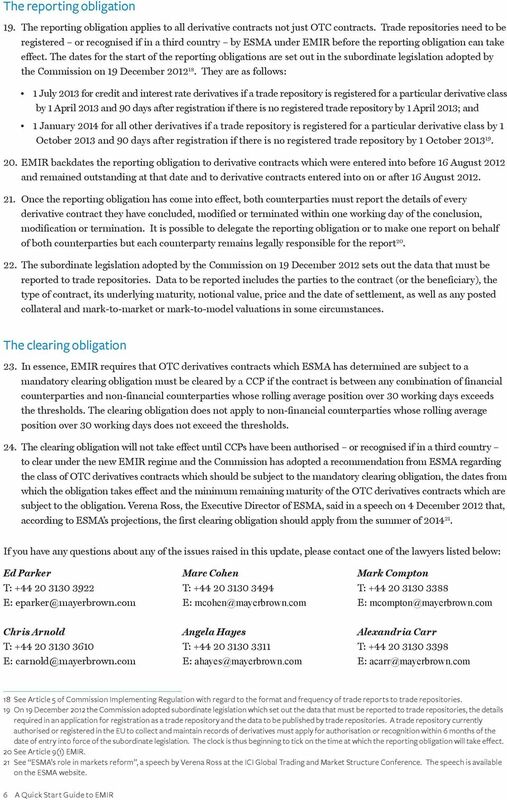 It appears that, although the first clearing obligation may not apply until the summer of 2014, the first reporting obligation may apply from 1 July 2013 and further risk mitigation obligations are likely to apply in or around September In addition, firms may need to make a number of notifications and applications for exemptions to the Financial Services Authority / Financial Conduct Authority in early At present, therefore, firms ought to be assessing whether they will be ready for EMIR to come into force. The quick start guide at page 4 sets out some of the things that firms should start to consider. What does EMIR do? 1. 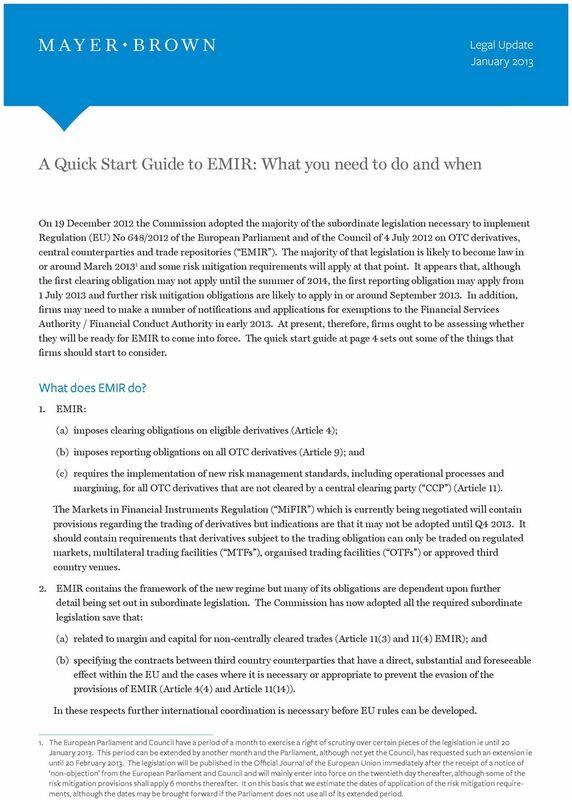 EMIR: (a) imposes clearing obligations on eligible derivatives (Article 4); (b) imposes reporting obligations on all OTC derivatives (Article 9); and (c) requires the implementation of new risk management standards, including operational processes and margining, for all OTC derivatives that are not cleared by a central clearing party ( CCP ) (Article 11). 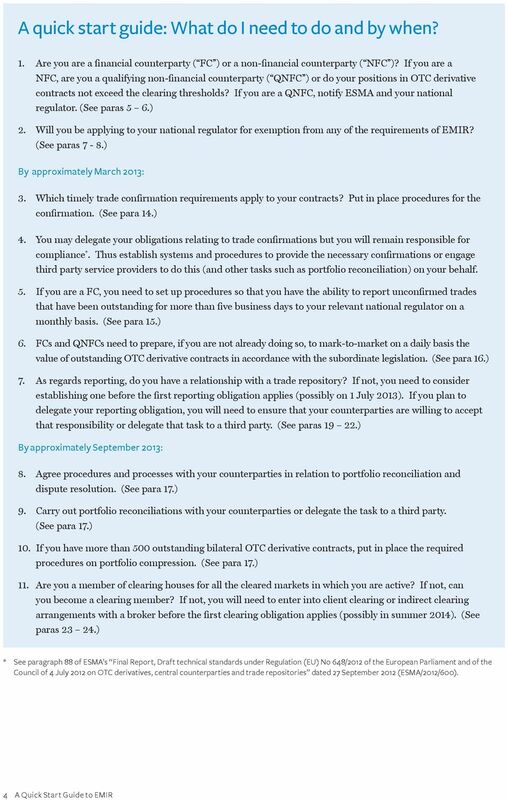 The Markets in Financial Instruments Regulation ( MiFIR ) which is currently being negotiated will contain provisions regarding the trading of derivatives but indications are that it may not be adopted until Q It should contain requirements that derivatives subject to the trading obligation can only be traded on regulated markets, multilateral trading facilities ( MTFs ), organised trading facilities ( OTFs ) or approved third country venues. 2. EMIR contains the framework of the new regime but many of its obligations are dependent upon further detail being set out in subordinate legislation. 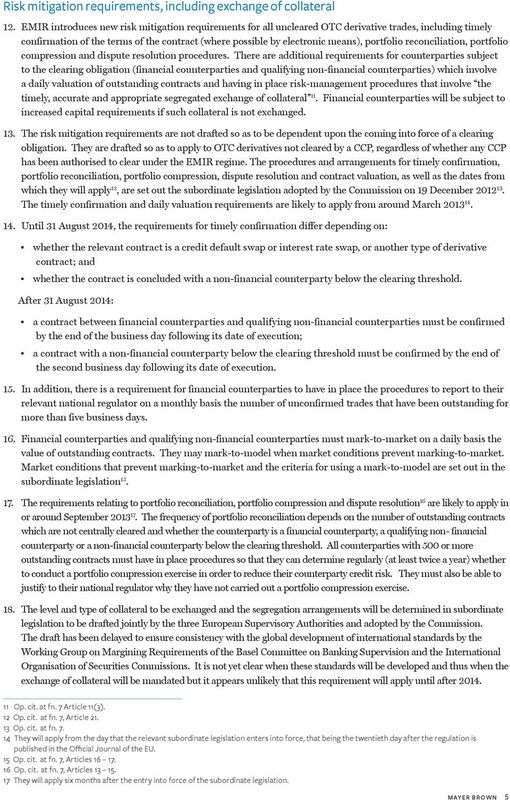 The Commission has now adopted all the required subordinate legislation save that: (a) related to margin and capital for non-centrally cleared trades (Article 11(3) and 11(4) EMIR); and (b) specifying the contracts between third country counterparties that have a direct, substantial and foreseeable effect within the EU and the cases where it is necessary or appropriate to prevent the evasion of the provisions of EMIR (Article 4(4) and Article 11(14)). In these respects further international coordination is necessary before EU rules can be developed. 1. The European Parliament and Council have a period of a month to exercise a right of scrutiny over certain pieces of the legislation ie until 20 January This period can be extended by another month and the Parliament, although not yet the Council, has requested such an extension ie until 20 February The legislation will be published in the Official Journal of the European Union immediately after the receipt of a notice of non-objection from the European Parliament and Council and will mainly enter into force on the twentieth day thereafter, although some of the risk mitigation provisions shall apply 6 months thereafter. It on this basis that we estimate the dates of application of the risk mitigation requirements, although the dates may be brought forward if the Parliament does not use all of its extended period. Good faith is there a new implied duty in English contract law? Pension Scheme Funding has become a must for corporates in the German marketplace. The need to optimize investment of pension assets means there are far-reaching opportunities for financial institutions. Sea of Change Regulatory reforms charting a new course. 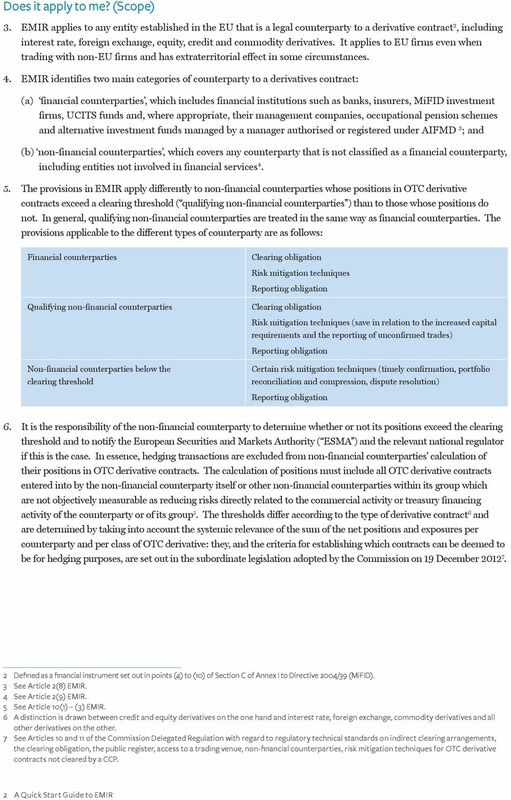 Regulation of OTC derivatives markets. A comparison of EU and US initiatives. Legal Update Intellectual Property Mainland China 13 September 2013 China s New Trademark Law Introduces Key Changes The PRC government passed a decision to amend the PRC Trademark Law on 30 August 2013. German Insolvency Law is geared towards liquidation of the debtor insolvency plan procedures are only applied in exceptional cases. Singapore Consults on OTC Derivatives Regulation. For many foreign investors acquiring a Banking License is a crucial step on their way into the German market. 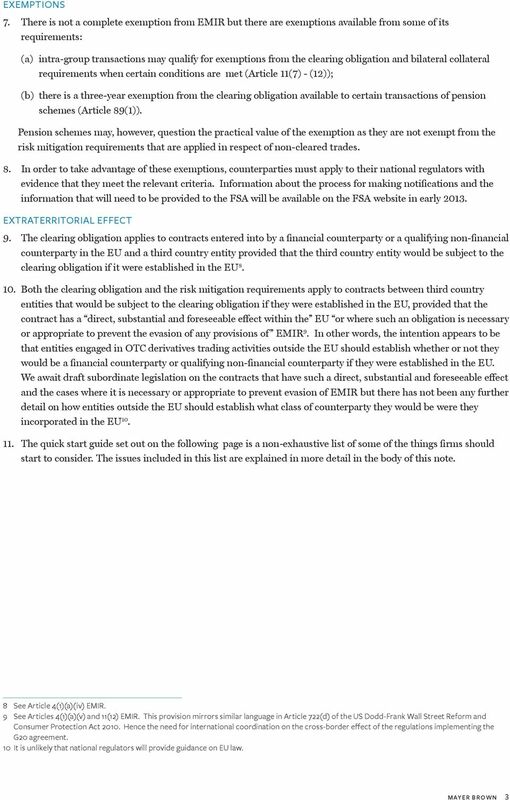 MiFID II. Key interactions between MiFID/MiFIR II and other EU and US financial services legislation. Commodity Futures Trading Commission Office of Public Affairs Three Lafayette Centre 1155 21st Street, NW Washington, DC 20581 www.cftc. The FTT will be due irrespective of whether the acquisition is carried out by a company or an individual.